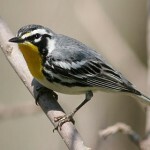 Description: Bright olive green upperparts; yellow face; and greenish ear patch; white below with black streaking on flanks; yellow tinge on lower belly; and two white wing bars. 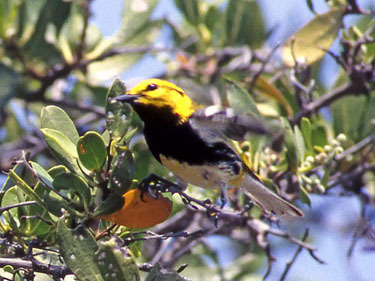 Male has black throat and upper breast. 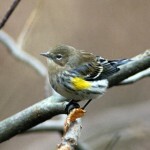 Female has yellow throat; black upper breast; shows much less black below; and has thinner wing bars. 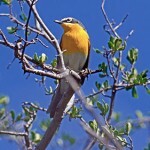 Behavior: Often remains hidden in trees while singing and is difficult to see. Habitat: Most often seen in deciduous or coniferous second growth forest, especially in willows and elms. Where in Nebraska: Uncommon spring and fall migrant in eastern Nebraska, becoming rarer westwardly.